I am an obsessive reader. When I decide that I’m interested in something, I go nuts finding all kinds of books, blogs, and digital content to feed the burning fire of curiosity. I find as much as I can and then move on to the next thing. Sometimes this is great – I can absorb information quickly and sate my curiosity. Sometimes, though, I need to slow down and drink in the message of the book. It’s nice to be able to nurse a book for a while instead of burning through it, or at the very least, read it again to pick up any broader scopes or fine details that may have been missed. For this, I love owning books. I like being able to read them again and again, as fast or as slow as I please. So I submit to you the books that I have found to be extremely helpful to me in getting my life together and giving my life greater purpose with creativity. Firstly, let’s chat about reading for a second. Specifically about what methods you like to use. If you’re like me, you have read almost exclusively from physical books and have a suspicion of new-fangled digital reading mediums. I must admit, I prefer that good old paper smell and the weight of a book. But I have grown to appreciate all the fantastic ways that books can be delivered into our hands nowadays, particularly because I live in a small apartment with very few bookshelves. Digital is a wonderful option – both for space and for your wallet. I even have gone so far as to acquire a Kindle Paperwhite, which is pretty much the perfect blend between paper and computer. I am surprised by how much I enjoy reading on this little device. If you are reluctant to split away from your physical books but are interested in trying digital reading, then this is the reader for you. There are a few other options, though, for a wide variety of prices. Explore the world a little more with the long reach of a digital reader. Kindle Unlimited – This awesome service is essentially a library right at your fingertips. You have unlimited access to over a million books and thousands of audiobooks on any device you want. And you get a month-long free trial! Audible– I love Audible. I was so skeptical when I started my free trial, but I quickly discovered how freakin’ cool it is to do mundane things while reading. I was cleaning the house, painting my toenails, even exercising – all while listening to a riveting book. You don’t know how neat this is until you try it. Thankfully, you can try it free for 30 days, which comes with 2 free audiobooks for your first month. Give it a shot! Kindle Reader – Still not sure about any of these digital readers? How about something that is free now, free tomorrow, and free forever? You can use the Kindle Reader on any device, including phones, tablets, and computers. Download this nifty tool right here! Did I mention that it’s free? Kindle Paperwhite – Like I was saying before, this is a great digital reader to help you get over that I’m-not-sure-about-this-digital-reader hump. It’s so lovely having all my books being the exact same size (which is to say I’m glad I don’t have to lug around a thick novel), and the paper white screen makes it so easy to read in bright conditions. If you are a heavy reader, you won’t regret getting this delightful little Kindle. The Konmari Method is a fantastic method about letting go of things that get in your way. Mainly, it deals with cleaning up and discarding objects that no longer give you joy, but the philosophy behind it is great for getting productive. I found this originally thanks to Boho Berry, and it’s been such a wonderful help in decluttering my life. David Allen has some fantastic methods for wrangling all the things in your hectic life while not losing your mind. I would highly suggest you read his highly useful tricks if you want to be a productivity boss. One of the best ways to kick your productivity into overdrive is to take control of your mornings. Get out of the old morning scramble routine and find a way to start your day with more peace, intention, and energy through the Miracle Morning. I read this book very recently (rather, listened to it on Audible) and I absolutely devoured it. Elizabeth Gilbert is a phenomenal writer, and her frank, humorous style make for a wonderful read about traversing the terrors of creative work. I highly recommend this book to anyone who wants to ignite their creative passion again. This book has been a Godsend to me. As someone who has been struggling with my creativity for years, The Artist’s Way has been a beacon of hope for regaining that old spark that I used to take for granted as a kid. This book walks you through a 12 week course on breaking down old barriers to creativity and is packed full of exercises, journal prompts, and other wildly useful information. This is where I discovered the Morning Pages, which has become a huge part of my daily success. If you have ever felt stuck in a ditch with your creative work, this book is for you. There is nothing more inspiring than the abundance of nature, and this book does a marvelous job at helping you realize the beauty around you. Take a look through the author’s eyes as she explores the wonder of nature with an artistic eye and see if you don’t come away inspired. And because this book is so little known and under rated, it is available for less than $1. So what is there to lose? Here’s a great book to introduce you to the lovely art of hand lettering. See step-by-step processes and techniques to take you to a whole new level and make you a lettering superstar. It’s a wonderful skill to have and it’s so marketable nowadays. Creative Lettering and Beyond is exactly what you need to get started today! This literary classic is a must-read for anyone, really, but I think it is especially wonderful for artists and writers. Thoreau has such a passion for detail and imagery that it’s hard not to feel like you’re right there with him. His writing teaches much about being present, seeing things as they are, and living simply – all of which are wonderful lessons for creators. Walden is an excellent book to add to your collection. There’s no denying it: books are awesome. And the sheer variety of ways that we can enjoy books is mind-boggling. What a time to be alive folks. 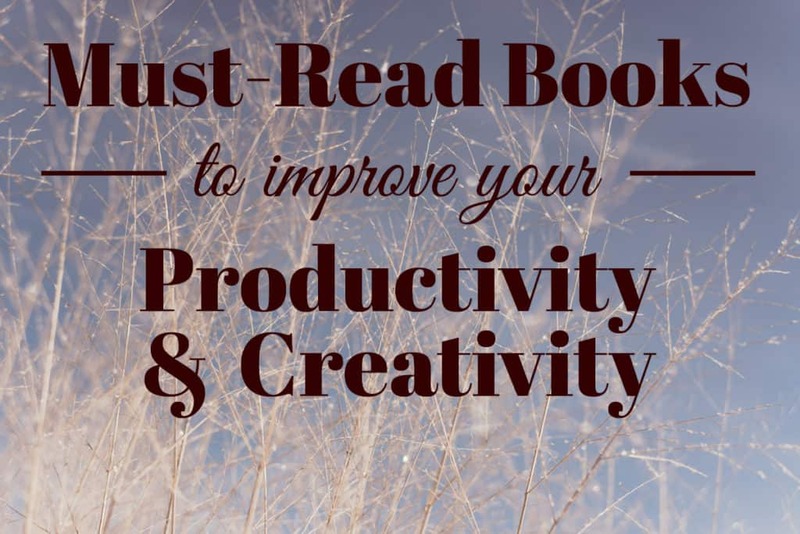 If you want to kick yourself out of a bad procrastination habit or into a new artistic binge, I’m sure you can find a book to help ignite you. So what about you? What books have delighted, inspired, and motivated you? Tell me in the comments below! I’m always looking to learn new things and expand my perspective, particularly if it helps me organize my brain or express my soul. « My Monthly Planner – September is Finally Here!